James (Jim) Newell was most probably born in the village, and continued to live there until he joined the Army during the Great War. He was born on May 21st 1896 and would have attended the Eton Wick Infant school until, at the age of seven years, he went to Eton Porny school, starting there in September 1903. He left school one month before his 14th birthday, at Easter, 1910, and the reason he gave for leaving is recorded in the register as "intention to work in a garden". Jim had at least two brothers, Arthur and William, and a sister Nancy. Arthur was two years older than Jim. William became well known in later years when he and his wife "Lil" became landlords of The Greyhound public house. Nancy married a Dorney man, and as Mrs Jacobs lived out her long life in Alma Road. The Newell family home was 2, Bell Cottages, Alma Road in Boveney Newtown and the father, William John, was a local farm worker. It is believed there was a fourth son named George and he was four years younger than Jim. Jim enlisted in Windsor, but we don't know when. The local paper regularly printed the names of service volunteers, but this depended entirely on families notifying the editor and sometimes they didn't. There were three families of Newells living in the village in 1914 and certainly five Newell men serving by 1916, but Jim was not in the listing. His family was not related to the other two. He may first have joined the Life Guards and later been drafted into the Household Battalion. This was formed at Knightsbridge Barracks on September 1st 1916 as an infantry Battalion, drawing personnel from reserves of the Household Cavalry (which included the Life Guards). Division. By this time the family home was at No. 1, Beaconsfield Place, Alma Road. On Easter Monday, April 9th 1917, British forces began an intensive attack in the Arras sector of the front with particular success by Canadian forces assaulting Vimy Ridge. The Household Battalion, as part of the 4th Division, took part here in the Battle of the Scarpe. Two days later Jim was dead. The circumstances of his death have not been established, although undoubtedly attributable to the very fierce fighting at that time. 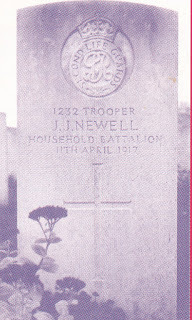 Newell, Jim, son of Mr & Mrs Newell of 1, Beaconsfield Place, Boveney Newtown, Eton Wick. Trooper with the Household Battalion. Killed in action, April 11th 1917. James John Newell. To the killed in action April 11th 1917. From his devoted brother Bill: Though lost from sight, to memory - ever dear. Jim Newell was not married, and was 20 years old. He is buried in the Athies Communal Cemetery Extension in France. The cemetery is situated approximately three miles east of Arras. His grave is number 29 in Row F. There are 310 recorded burials there from the Great War: 287 soldiers from the U.K., 21 South African, one Australian and one German. Jim is commemorated on the Eton Wick Memorial and on the Eton Church Memorial Gates. James Newell: Live of the First World War page. from the start of April 1917. Additional information: The 1901 and 1911 census records show that James Newell was born in Boveney.